Keep a close watch on your pet's eating patterns. Many cats love to eat, but some overdo it. Obsessive eating can be detrimental to a cat's health. Not only can it lead to obesity, it can lead to a variety of potentially hazardous ailments. If your cat seems to want food all day, he may have an obsessive eating problem. Cats can become obsessive eaters due to a variety of factors, including competition among fellow pets. Some cats eat obsessively just because the food is available. In the wild, cats are opportunistic hunters and feeders. Not only will cats take almost any nearby sustenance, they'll consume what takes minimal effort to attain. Allowing your cat to eat as much as she wants may seem fine, but it isn't. Overeating frequently leads to weight issues, which can bring upon severe health consequences in cats, just as in human beings. If your cat has a little -- or a lot -- of extra weight on her body, she may become susceptible to such conditions as liver issues, diabetes mellitus, hepatic lipidosis, cystitis and breathing disorders, among others. To overcome your cat's overeating, consult a veterinarian. Feeding on a set schedule, minimizing treats and eliminating table scraps from her diet. If your cat can easily get into your kitchen trashcan, it may be time to look for one that's equipped with a sturdy lid. If your cat eats a lot but you can't tell whether to classify it as obsessive or not, take begging into consideration. If your cat cries to you for food literally every time you walk by, even after he just ate, his desire to eat may be an obsessive and immoderate one. Perhaps he knows what to do to get you to give him what he wants -- and he takes advantage of it, whether it's head-butting you or crying persistently. Constant begging is usually a red flag for a cat with an obsessive overeating habit, so take note. Feeding compulsions in cats are not the same as obsessive eating habits. If a cat experiences a seemingly irrational and uncontrollable urge to eat something, it's probably a compulsive action rather than an obsessive one. Cats often develop feeding compulsions as a result of emotional stress, frustration or anxiety. For instance, if your cat is feeling anxious due to being in a brand new apartment, he may act out by chewing on or eating things that aren't edible -- say envelopes, paper bags and blankets. Some cats participate in compulsive actions as displacement behaviors. For example, if your cat wants to go downstairs but can't open a closed door, he may attempt to manage his stress by switching his focus -- compulsively eating the napkin from your coffee table. 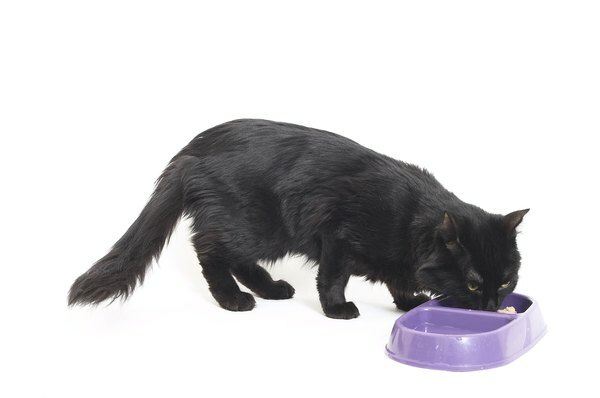 Cornell University College of Veterinary Medicine: How Often Should You Feed Your Cat? Can Cats Transfer Bacteria or Disease to Humans Through Saliva? "Matted, Damp Fur on Dogs That They Keep Licking"
Does a Dog or Cat Know Their Owner Has Died?